The Tag-Z Platinum Mousse Changer is a new design in the Tag-Z range! It has been designed for use with 18, 19 & 21? wheels and features a high impact bead breaking bar. Constructed from high quality steel it has been designed with the aim of an intuitive and safe mousse/tyre change at the track, workshop or at home. The grip featured handle allows for an easy and safe hold whilst allowing for an easy removal of the tyre from the rim. Just a quarter of the bead on one side needs to be removed and the breaker bar will do the rest of the work for you. 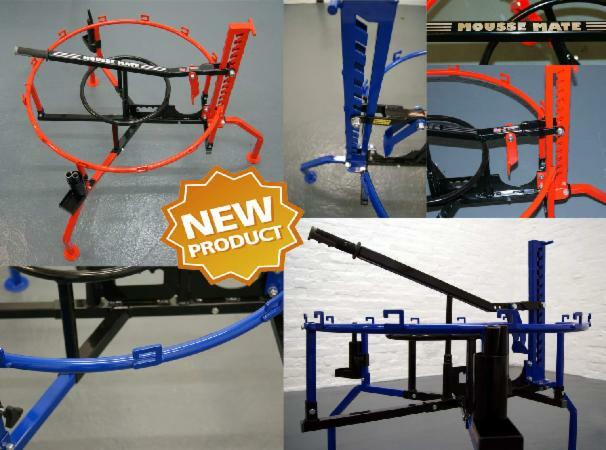 The unique base design offers unrivalled support of the changer whilst changing your mousse/tyre. Spindle size is adjustable; comes with 3 pin sizes 14, 17 & 19mm. 19mm can be adapted to fit 22 & 25mm spindles. Comes with heavy duty wheels, Max load of : 400kg Flat packed. TAG-Z Foot lever operated dirt bike stand for both workshop and paddock use. Constructed from high quality steel with a powder coated finish. Foot operated, leaving both hands free to support bike when raising and lowering the stand. Max weight 250kg. TAG-Z LOGO Bike Stand. A light weight stand, constructed from high quality steel with your bike logo and team colours Powder coated finish. Stand is 440mm high. Can be made in any colour for your showroom. TAG-Z Triangle side prop stand. TAG-Z Triangle side prop stand. A handy and convienient stand, mounts into rear wheel spindle hole or by foot rest mounts. Arched lower frame provides stability on uneven ground. Constructed from high quality steel and available in 9 different powder coated colours: Blue, Black, Gun Metal, Green, Orange, Red, Silver, White or Yellow. Fits most bikes; MX, Enduro, Trail from 80cc to 600cc. TAG Z Heavy Duty triangle side prop stand. A handy and convienient stand, mounts into rear wheel spindle hole or by foot rest mounts. Arched lower frame provides stability on uneven ground. Constructed from high quality steel. ATV quick jack (Universal), can be used on front or rear of ATV. Constructed from high grade steel with a red powder coated finish. Jack rise height is adjustable from 32cm - 46cm from ground. Ideal for that quick stop in the pits. 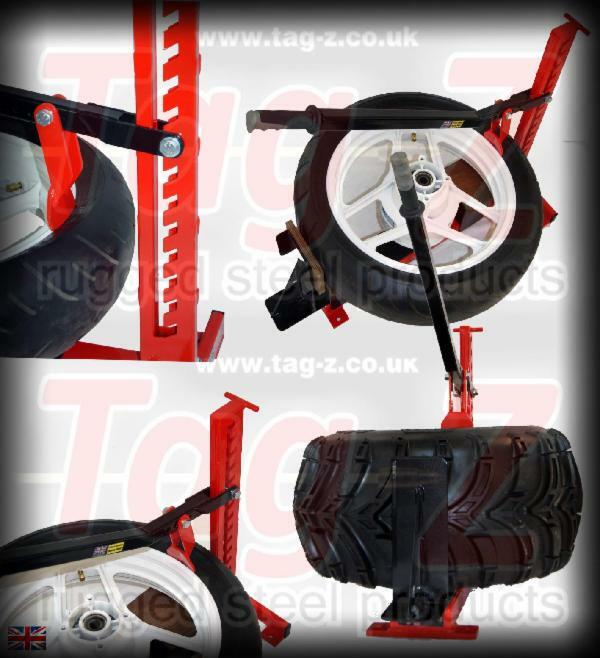 The Tag-Z Motocross Lift is a hydraulic scissor lift which lifts most off road machines including motocross, supermoto and enduro bikes to a comfortable working height of 84cm. Operated by a hydraulic foot pump. The springs on either side of the lift hook onto foot pegs and hold the machine firmly when at maximum height. When this lift is at its maximum height it can be locked, so no unnecessary stress is being placed on the hydraulic pump therefore this can be left for storage etc with no problems. Safety pin to lock the stand when up. TAG-Z Work bench, ideal for any setting. Showrooms, Race meetings, and Workshops. Ideal working height. Heavy duty steel constuction, with a top quality powder coated finish. Comes flat packed and easy to self assemble. Splits in two for easy storage. Stock Colours. Blue or Red. Max weight 500kg. Steel Folding Ramp with 50mm sides (TAG-Z)Black. Tag-Z Folding steel ramp. Great for road and off road bikes, Constructed from high quality heavy duty steel and available in 2 different powder coated finishes: Black or Silver. The sides have been add to help keep the tyre in line, when pushing the bike up the ramp. Overall Length 2mt, 1.2mt when folded. Max load 420kg. In testing the Tag-Z ramp is the equivalent to a 470kg max load aluminium ramp. Sold individually. 12KG RAMP *Do not ride your vehicle up ramp. TAG-Z Single bike trailer. Constructed from high quality steel with a black powder coated finish. Designed to accomodate off road and Road bikes. 250Kg max weight. Trailer features a single wheel channel and comes complete with 4 securing loops, trailer board and a 50mm coupling. TAG-Z 3 bike trailer. Constructed from high quality steel with a black powder coated finish. Designed to accomodate off road and Road bikes. 750Kg max weight. Trailer features a 3 wheel channel and comes complete with 12 securing loops, trailer board and a 50mm coupling.